Performers include: Steve Carell, Jenna Fischer, Rainn Wilson, John Krasinski, B.J. Novak, Leslie David Baker, Brian Baumgartner, Angela Kinsey, Phyllis Smith, Kate Flannery, Mindy Kaling, Creed Bratton, Paul Lieberstein, Oscar Nunez, Ed Helms, Melora Hardin, Craig Robinson, David Denman, Rashida Jones, Andy Buckley, Robert R. Shafer, Charles Estan, and Hugh Dane. Based on a British series of the same name, this sitcom revolves around a group employees of the Dunder-Mifflin box company. Their day-to-day activities are being recorded for a documentary film. 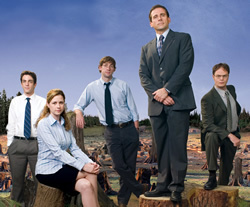 The staff is made up of socially-awkward regional manager Michael Scott (Steve Carell); gullible, know-it-all assistant regional manager Dwight Schrute (Rainn Wilson); intelligent prankster sales representative Jim Halpert (John Krasinski); obnoxious traveling sales representative Todd Packer (David Koechner); shy receptionist Pam Beesly (Jenna Fischer); and blue-collar warehouse employee Roy Anderson (David Denman). A year after the airing of the documentary, present and past employees gather for a reunion event and the wedding of Dwight and Angela. First aired: May 16, 2013. What do you think? Do you like The Office TV series? Do you think it should have continued for another season? Finally. Outlived it’s novelty by at least 6 years. Finally NBC is pulling the plug on this piece of **** and with it will be the end of one of the dorkiest shows ever created.